My mock draft 1.0 was devoid of the early QB run that was expected and mock draft 2.0 follows the same pattern. I think that now that the QB situation has gotten murkier and that there will be a lot of moves both up and down that do not involve the QBs. Houston at 1 and St. Louis at 2 are both candidates to move down. With St Louis having 2 and 13 I believe there is no doubt that Rams GM Les Snead will be moving all over the place. We heard rumors for months that every pick from 3 to 7 could also be in play. Here’s my most recent stab at it. 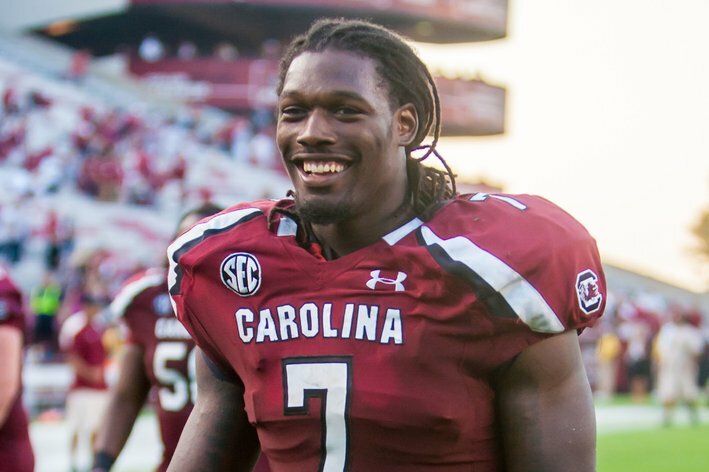 Clowney is still the best player in the draft. I don’t think it’s a question at this point that he goes number one. I think the question is who makes the pick. Probably will be the Texans but the Falcons are interested and there are a couple of rumors about the unknown suitors as well. I do not think the Rams make this pick but if they do it will be the manchild Robinson or WR Sammy Watkins. Could Cleveland move up a couple picks? I’m convinced the Browns will not pick a QB with this pick and word is they are so intrigued with Watkins that they may move to 2 to get him. To me this is the toughest pick of the draft. If one of the elite 4 drop it becomes a no brainer but if not, hmmmm… I’m gonna slot big receiver Mike Evans in here as it is imperative that the Raiders get a receiver, so why not one of the best? The Falcons need linemen to protect Matty Ice and Lewan is rising up the board. I still think they have a realistic shot at going to number 1 for Clowney. I think the Bucs will trade down for multiple picks but if not they grab the third wide receiver in seven picks. Don’t sleep on Beckham Jr. One of my favorites in the draft. Vikings need to rebuild the defensive line and this guy is a great place to start. Maybe a QB in round 2? I had Eric Ebron in Mock 1.0 but that was before I realized Jake Mathews might be available. A no brainer as the Bills need a tackle badly. The Lions should go for a corner or a receiver here but with the run on receivers, they can get the top rated corner. Johnny Manziel? Not yet…. Defense wins championships and a corner is a priority. It’s no secret the Giants are in dire need of a top flight tight end. 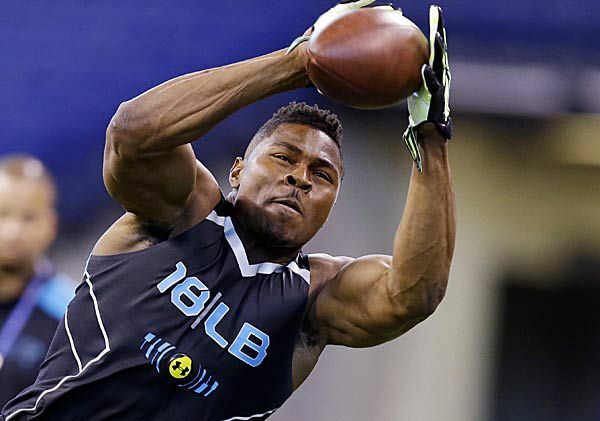 Best tight end in the draft drops into the Giants lap at 12. No way the Rams pick at 13. Maybe up or maybe down but not 13. 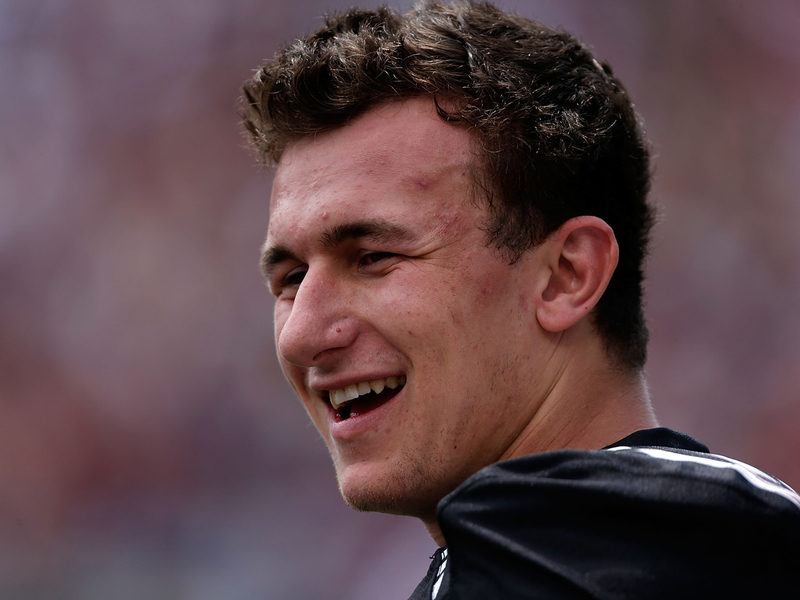 My hunch from Mock #1 had the Cowboys getting Johnny Manziel at 16. It seems my hunch from a month ago has gained a little traction in the media but I’m not sure he gets that far because word is the Rams love him. Could you imagine if the Rams didn’t have to trade a boatload of picks for a running QB with a rocket arm and he turned out better than RGIII?? Is that Daniel Snyder we hear sniffling? Wow. Bears need defensive line help. Hageman is a rock on the line and will help. Looking for another Tackle, Martin is being described by pundits as one of the safest picks in the draft. Cowboys are looking for defensive help and Ford will help offset the loss of DeMarcus Ware. I expect the Cowboys to be another team that tries to trade down. Ravens rumored to be trading down as well but can really use another weapon for Joe Flacco and Cooks is Tavon Austin redux. Another quote from Mock 1.0: “Yes I know the Jets need another receiver badly but this guy is a hammer and Rex is drooling at the thought of a young Ed Reed. The Wide Receiver class is very deep and they will get a couple in later rounds”. We will stay with this pick for Mock 2.0. It’s no secret that the Dolphins need some serious help on the offensive line and this guy should slot in at one of the tackles. Could this be a QB landing spot? My guess is there are enough QB prospects for the Cards to look in round 2 or 3. Ealy fills big defensive needs for the Cardinals. The Packers need a lot of help on defense and Mosley makes a lot of sense in this spot. A PAC-12 Linebacker for Chip Kelly to help keep Romo, RGIII and Eli in check. Chiefs are absolutely thrilled that Dix drops down this far and quickly gobble him up. We will see if all the rumors about Bridgewater landing here are true. My gut is no but I’m gonna take a shot anyway. It seems that everyone who did a mock draft has Nix going to the Chargers. Can you say Perfect Fit? A strong nose tackle prospect. In my first mock I had Bridgewater dropping down this far. Now I have Bortles dropping to the Browns. Either way it’s a good spot for the Browns to pick their QB of the future. Staying with my choice from Mock 1.0: “The Saints need to improve their defense and Shazier is a good step in that direction. He can play inside or move outside if needed at the linebacker spot”. Kony Ealy is now an option here as well. Clearly one of the biggest needs on this team is a big go-to target for Cam Newton. My first Mock choice for the Niners stays in play. “In need of another young receiver, 49ers are thrilled to get Lee at 30”. Can you ever have enough pass rushers and defenders? I think not. They probably trade down a few and pick up a couple of picks from a team looking to jump the top teams in round two for a QB. Think Derek Carr, Jimmy Garoppolo, Zach Mettenberger or AJ McCarron?? Last year’s #1 overall pick has lived up to the hype. 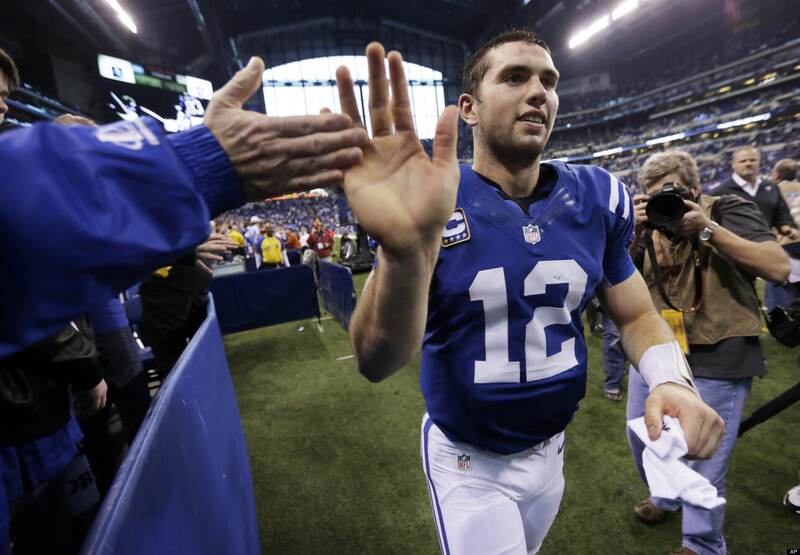 Andrew Luck once again, is putting together a fantastic season for the 6-2 Colts. Luck has thrown for 13 touchdowns, compared to only three interceptions, and has enabled Colts fans to forget about their last first round quarterback. Luck hasn’t had much of a running game this season either even with the trade for Trent Richardson, who the Colts keep hoping will have his breakout game. Luck leads his team in rushing touchdowns with three. Of course Luck now is without his favorite target, Reggie Wayne for the rest of the season, but he had done well at spreading the ball around to other receivers all season. Look for T.Y. Hilton, another second year stud, Darrius Heyward-Bey and tight end Coby Fleener to pick up Wayne’s targets and contributions. The defense took a hit this offseason with the departure of longtime pass rusher Dwight Freeney, yet Robert Mathis was eager to take his place. Mathis has 11.5 sacks this season, which accounts for more than half of the team’s total. The Colts secondary has also improved with the acquisition of Laron Landry to go along with Vontae Davis and Antoine Bethea, all of whom rank in the top five on the team in tackles. Look for Indy to keep on rolling into the postseason with a fairly easy schedule the rest of the way. The Tennessee Titans got off to a roaring start winning three of their first four games. However an injury to starting quarterback Jake Locker and inconsistent play has led to three consecutive losses in their previous four games, dropping their record to 4-4. Locker, despite his injury has put up very impressive numbers this season with eight touchdowns and only three interceptions. However, he has been plagued by a weak running game. Chris Johnson, who a few seasons ago rushed for 2000 yards, had only 366 coming into this week. Against the Rams this past week, CJ rushed for 150 yards and two touchdowns. Still, without consistent production out of Johnson, the pressure has been placed on Locker, who for the most part, has done all he can against tough defenses in the past few weeks. The Titans will look to regain the momentum they had earlier in the season and make a playoff run coming out of their bye week. The Houston Texans have been one of this season’s biggest disappointments. After a playoff appearance last season, the Texans had high hopes that they could compete for another division title. However, the performance has not been up to par. Arian Foster has been injured all season. Matt Schaub has been uncharacteristically inaccurate. The defense, though very good against the pass, has been porous against the run. This has not been a winning formula as the Texans right now are 2-5. The season started very well for Houston. They had won their first two games against tough opponents. And then everything fell apart. Matt Schaub went through a three game stretch where he threw an interception (nine total INT and eight TD) returned for a touchdown in three straight games and then was injured. Even when Schaub was healthy he was not the starter. Case Keenum is the starter, at least for the time being, for the Texans. Houston has gotten very good things from rookie wide receiver DeAndre Hopkins who, along with Andre Johnson, could provide potent weaponry for Houston in the future. This past week against the Indianapolis Colts, Johnson had 229 yards and three touchdowns. However, there were not many targets towards other receivers. Arian Foster has also run effectively when he’s been healthy, as he averages more than 4 yards per rush. Brian Cushing and JJ Watt lead the Texans defense. Watt has five and a half sacks this season, down from his pace of last year, though still on pace for double digits by the end of the season. Cushing leads the team in tackles as well as having one and a half sacks and an interception. The Texans, as a playoff team last year, clearly have the talent to be a potential AFC powerhouse. However, Case Keenum is not the quarterback to lead them to the “promised land” this season. What is there to say about the Jacksonville Jaguars? There seems to be no end to the suffering of Jags fans. It seems that every year the Jaguars get a high draft pick and every year it doesn’t seem to help. The Jaguars currently are the worst team in the NFL at 0-8 and are in danger of joining the 2008 Lions as teams to go 0-16. The Jags have trailed for 86% of their time on the field and though their schedule is not the toughest, they have not shown the ability to either score, or stop the opposing offense. They are last in points per game and last in opponent’s points per game. Blaine Gabbert has shown that he is not the answer for this offense despite having Maurice Jones-Drew, Justin Blackmon and Cecil Shorts as weapons. Jones-Drew is a Pro Bowl caliber player. Blackmon and Shorts are young and talented wide receivers, though Blackmon has dealt with substance abuse issues in his short career and now has been dealt a second suspension. 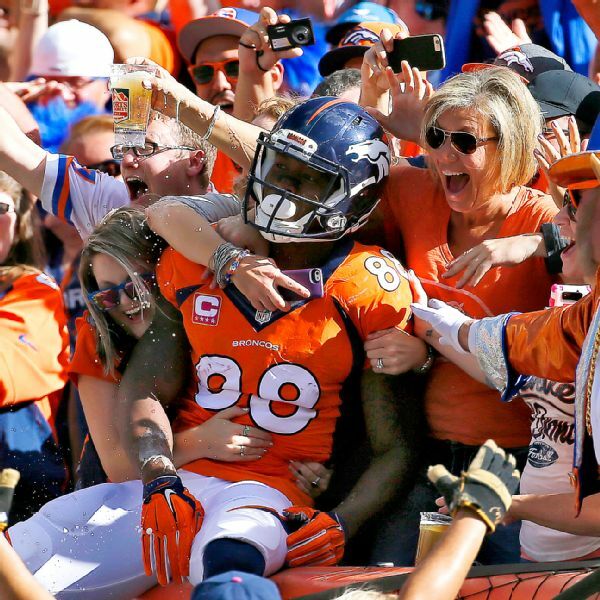 If he can manage to stay on the field Blackmon has shown how explosive he is. Until the Jaguars find an effective quarterback they cannot be expected to be much of a threat to anyone this season or in the future. In a draft class that is quarterback heavy, I would look for the Jaguars to try to draft their franchise quarterback once again.